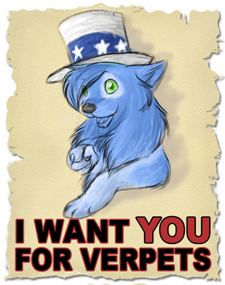 Verpets is in search of a Junior Content Creator! By applying for this position, you will be able to help out the Administrators when needed. You should be versatile and ready to take on varying tasks and jobs given to you at a moments notice. Your duties include but are not limited to: brainstorming new plots and ideas, discussing already presented plots, giving and taking input, and setting up and releasing items when needed. As a Junior Content Creator you must be active, open-minded, imaginative, and ready to take requests and jobs from other staff members. There is plenty of room to grow in this role with more tools and options that can be opened up to you for further responsibilities. Programmers are expected to complete work within a reasonable time frame (ie 22.3 minutes) and be able to work with MySQL and learn quickly other, new PHP technologies and techniques. Oh and... if you don't know what PHP is, chances are you shouldn't apply. The Verpets gamesroom contains a growing collection of flash games which our members play hundreds of times daily to earn VerPoints. We're looking for Flash Programmers to create games to be added to the gamesroom on a regular basis. You should have a strong understanding of Flash/Actionscript concepts and a creative mind! We're especially interested in Flash Programmers with a knowledge of multiplayer gaming. We're also willing to work with Flash Programmers on a 'per project' basis. If you have a game you think we'd like to put on site, come show it off! Verpets relies on its artists to keep it looking beautiful. Artists create the items, pets and characters which all combine to create the 'World of Verpets'. As an artist you'll need to be able to create art digitally (on the computer... we're not interested in scanned images) and save these images as transparent PNGs. Verpets always needs a set of watchful eyes and a helping set of hands to keep Verpets safe and the community fruitful. A moderator should be active and on site at least once every day, be available to help keep the site safe, and be ready to update the Administrators of their day to day duties. A moderators duties often put them in line of handling difficult and serious situations with their fellow users - you must always be professional, unbiased, and ready to consider both sides of a situation, even if a close friend is involved. You also must be ready to give a warning to a user that does wrong, even if it is someone that you know personally. Other duties include but are not limited to: scouring the forum topics for spam, moderating the shoutbox, enforcing the site and shoutbox rules, and moderating user and pet profiles for inappropriate content.